to derive some ideas about the amount of work was done. obviously it wont be perfect but I think we can come up up with some cool ideas. My initial idea was to convert each point to a coordinate. each coordinate would have a radius, the radius would cause coordinates to overlap and "clump" causing a larger radius to be formed. This larger radius might then touch other coordinates and so on. at some point can suppose that the left most coordinate of a cluster for a series is the beginning and that the right most edge of the radius of a coordinate or cluster would be the hypothesized end time. this bounty is to come up with some ideas on algorithms that could be used to solve such a problem. I have prepared 5 days of events we can use as the sample set. Ideally your algo will have some ideas about how to estimate this. you dont need to base it on my coordinate idea... it was just an idea. Your algo should have some way to understand/prove what it thinks is the solution is. depending on approach we ask that you document how to dial in the thresholds of any variables. Im open to the tech being anything from R to js to python. Im really just looking for good ideas. We will award the winner the full bounty and we will award the next 2 runner ups with a $25 bounty each. Thanks for your time and ideas in advance! I'm not sure if in your hypotheses that 1) idle time between chats represents work, or 2) amount of "uninterruptible" chat represents work. Could you confirm that U033Q5G5P is the developer and U09JZ6P60 is the PM? Seems to be the case, but since U033Q5G5P has the first recorded message I'm dubious (maybe you truncated it)? What about we treat all the time instead as a combined line chart? We got a conversation between two guys, chatting about everything, and a timestamp for each message. Using the timestamp and some algorithms we can achieve a starting point for variables so we can construct the chart. The Y axis will be the amount of time that was taken for each user to answer. Easy as that, calculating the longest time we could talk about seconds, minutes or even hours. This can be configurable in Chart JS too! The X axis will be the total amount of time that was taken for the conversation to end, starting from the first message to the last one, there's no need of math for the X axis in this since we can make a switch case where the program will choose what's going to be the range between each division. The bars are going to be the representation of each user, so we can identify in the timeline what user had the most or least response time in each conversation. We could even use the curves to get an expectation of how much was the difference between time responses for each user in the conversation, including the number of words for each message. We can make a sort of "scoreboard" where we rate how much work was done in the conversation. If there's a high score, it means the users worked hard (a good working conversation). How to achieve this? The conversation will be given a score if there is lots of words for each message (maybe a constant multiplier for each word? ), and if there's little time between the messages, it will receive "points" . If there's 15 minutes between each message or more, it will be given half the points, if there's more than 30 minutes or 45 minutes (you choose the threshold, i'm just using random constants) it will not be given any score. By using this way, you can get a "rate" of how much fluid the conversation was, even make it in tiers (bad, regular, good conversation). Tell me if you like the idea! I could get up to something myself with this one. Sounds really fun! When I read your circle idea, I couldn't stop thinking about it, so this is somewhat similar. I first thought of spacing out chat messages based on their time, like this: https://imgur.com/a/Roa9Gkb. (I wish I could include images in this post). The chats are not tied to any real time, but rather just spaced out based on the time increments between chats. I drew a semicircle from each point to its next neighbor: https://imgur.com/a/AfNLktH. As you can see, points further away from each other have bigger semicircles with taller radii. I then added the word count of the chat message to the radius of each semicircle so that they would overlap and each circle would become a little bigger. The final result was this: https://imgur.com/a/whlfBGi. The 'total work done' is simply the sum of the area of the half circles. This algorithm provides correct measures of work because it takes into account variables of time increments, message length, and conversation length in determining the work value of a conversation. How is a 'conversation' defined? Like this: I split up the list of chats into sublists separated by periods of no activity above a certain cutoff point, like when the work has 'tapered off'. Here's an alternative solution to the circles/radius idea. 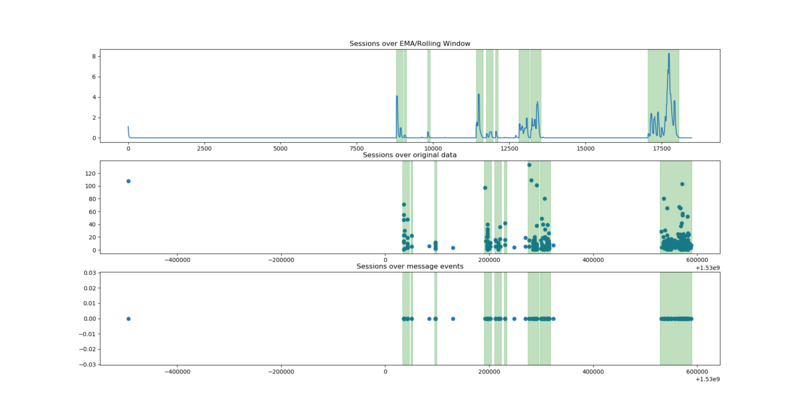 I went ahead with grouping message events into periods (1 minute by default). Then, using exponential moving average (EMA), periods get smoothed out with their neighboring periods. The smoothing also adds a period decay. Optionally (turned on by default) a rolling window is applied as a 2nd pass, to smooth out periods even more (but it is not really necessary with fine-tuned EMA). 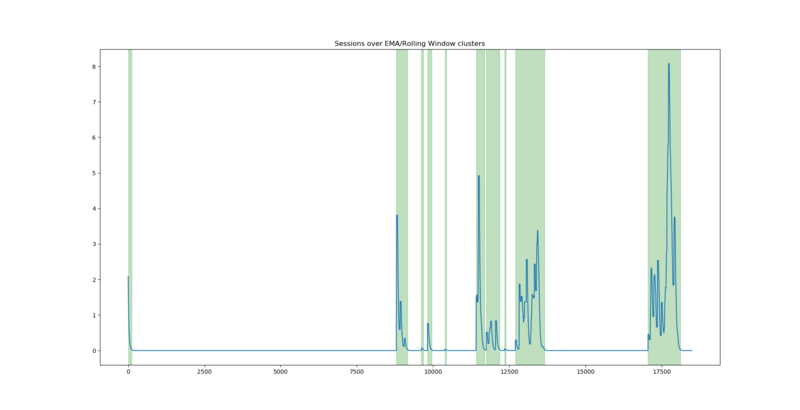 After all the smoothing, periods now form clear clusters, that are then extracted as sessions. Here's an example of sessions over produced clusters. 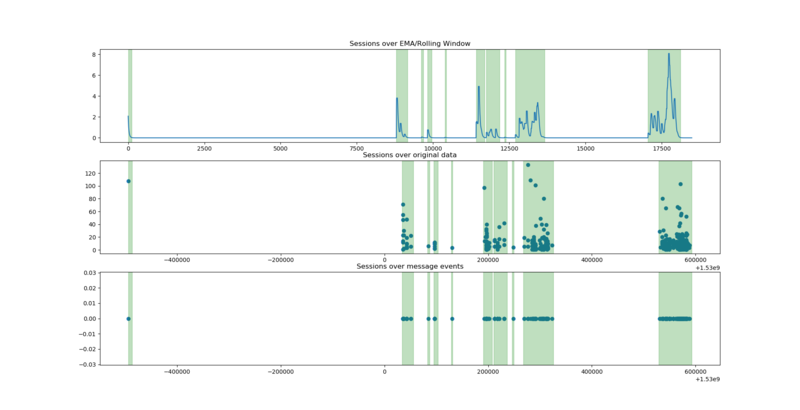 More example plots can be seen below, with outputs. By default I'm not excluding sessions with only one participant, since my assumption is that work can be done even if there's no immediate response from others. This can be disabled with --nosolo argument. Maybe a better solution would be to mark PM users and exclude sessions where they're the only participants, since those are most likely pings. -p / --period: Specifies the period length in seconds. Defaults to 60 (1 minute). Note: Period also represents the session duration's resolution. E.g. a 30 minute period setting means that the shortest period will be 30 minutes, and will increase in steps of 30 minutes. -w / --window: Specifies the rolling window size - the number of periods used for smoothing. Defaults to 60. Note: This also affects decay, greater values will increase decay and in turn will promote larger cluster formations. -s / --span: Specifies the decay for EMA in terms of span. Greater values will increase decay and in turn will promote larger cluster formations. Defaults to 60. -t / --threshold: Specifies the threshold over which session clusters are registered. Since the values get smoothed, they often require a lot of decay to actually get to 0. This helps with filtering out all non-significant period values. Default: 0.025. -r / --rolling: Disables 2nd pass rolling window smoothing. Default: Rolling window is enabled. -P / --plot: Plot the results. Helps with visualizing and fine-tuning the parameters, to get right kind of sessions extracted. Examples of this can be seen down below, with outputs. -n / --nosolo: Exclude sessions that have only one participant. Default: false. I have some other ideas for this and will try to implement and post them if they're successful. Your coordinate and circles idea reminded a lot of the concept of metaballs. This is based on the sample dataset. 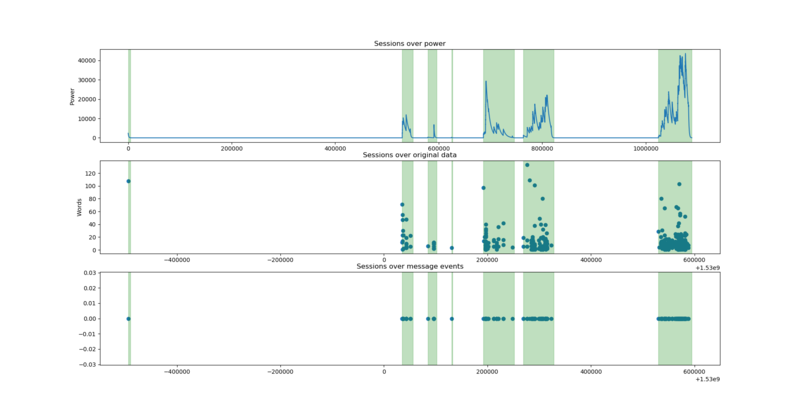 The horizontal axis is the time of day from left to right, the vertical is the date from top to bottom (empty days only count as one to avoid dead space) and the orange/green colors represent the two different users. There is one ball per message and the radius depends on the square root of the number of words. 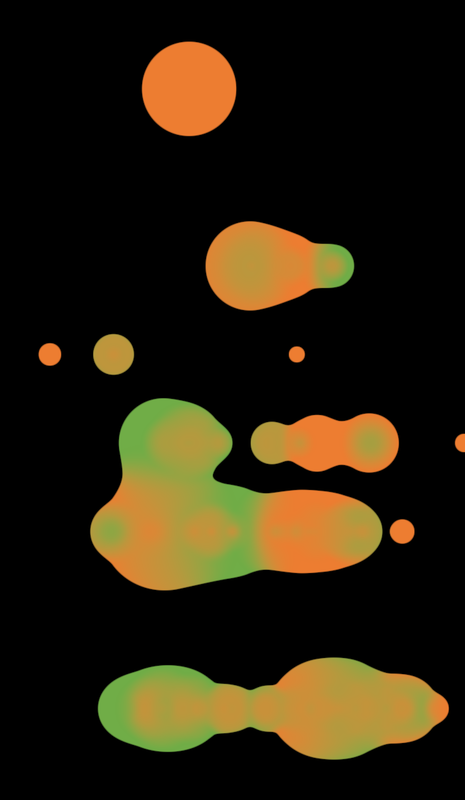 Thanks to the nature of metaballs, multiple small messages in close proximity merge into a bigger ball. Note: The constants at the top (in ALL_CAPS) can be changed as desired, as well as the radius_fn function. CSV_FILE = "combined 5 days-bounty.csv"
effective area into a float buffer. """ Edit 1: Fixed timezone bug (the local timezone was always used). Edit 2: Cleaned up the code and tweaked the constants. Added proportional work representation, and total work time per user. Added option to ignore work sessions involving only one user (enabled by setting IGNORE_LONE_WS to True). Added option to clip work sessions by the time of the beginning and end messages (enabled by setting CLIP_WS to True). This is cool. Will review in detail when back at the office tomorrow. Here's another solution I came up with. This version is fast and a lot more configurable. All of the calculations/session extraction is done in a SINGLE iteration over the original data (provided that data is chronologically sorted). With this solution, I'm not using any kind of window averaging/smoothing. Instead, power points are simply assigned to a message and then power decay is calculated that happens until the next message event. If power has decayed under a certain threshold, a new session is started, otherwise, the event is added to the existing session. The decay is applied as an exponent - power = power * decay_coef^decay_step. There are two decay coefficients - connection-decay and session-decay. Connection decay coefficient is used when a message can connect with another message before power has decayed. Otherwise, if the message cannot connect to another message, session decay coefficient is applied instead. This helps for example with creating more sparse message connections, but with faster decay for last message in a session, so there's not too much work duration lingering after a session is done. EDIT: Split decay-coef into connection-coef and session-coef, more info in main description and under argument documentation. Also added more example configurations with outputs and plots. EDIT2: Added converted csv file.